Are you using Pinterest for your small business? Pinterest is a powerful marketing tool for driving traffic and reaching new clients through pin exposure. This post contains affiliate links, click here for my full disclosure policy. Pinterest is a powerful marketing tool for driving traffic and reaching new clients through pin exposure. If you aren’t using it, you ARE missing out on your target client. Start a brief experiment—go to Pinterest and search a few keywords that identify with your brand and analyze the results. Do they show your competitors or are they missing? Do the results have good image quality? Is there room for your creative small business on Pinterest? The answer should be a resounding yes! Pinterest is a search and discovery tool. Users infrequently discover content from viewing their smart feed on the home page. Instead, they are using Pinterest as a search and discovery tool by using the header’s search bar, searching for recipes, ideas, and items to purchase. They are taking action—either to plan for a future purchase or for a current purchase NOW. You want your target audience to be able to discover your brand and/or shop. 250 million users are using Pinterest! (That’s up 25 million from last year!) Not surprisingly, 80% of users on Pinterest are women between the ages of 25-54 and, on average, they have a higher income than other users of social media platforms. They are ready to purchase. In fact, 93% of users pin to plan for a purchase! As a visual tool, Pinterest is the perfect platform for a creative small business. You get the opportunity to display your product and share with your target audience, allowing for exponential growth through re-pins. The half-life exposure of Twitter and Instagram is so brief (the average lifespan of a tweet is 18 minutes), but you have the unique opportunity to take one pin and experience exponential growth through Pinterest users constantly searching and discovering your content through keywords. I love the power of Pinterest! How do users discover your pins? Instagram, Facebook, and Twitter rely on hashtags for content discovery. Hashtags are not useful on Pinterest (Hashtags are IN, learn more from my visit to Pinterest Headquarters). Keywords (get help with keywords on Pinterest here) are the most important tool for content discovery. Keywords can be used in the Pinterest image, pin description, as well as your personal profile and boards. Use them well—be simple and clear. Elaborate keywords that aren’t common, unless they are important in your niche, won’t benefit you as much as a general keyword. Use them generously in your descriptions. Secondly, image quality and size are paramount! If you conducted the keyword experiment I mentioned above, how was the quality of the images? Did any of them stand out? Chances are you were most likely to click on the best quality images. Your images need to POP. Investing in a good camera and some practice or, better yet, hiring a stylist/photographer to capture your products can take you so far! As a small business myself, I love that Pinterest feels casual. It’s the type of platform that best meshes with Yoga pants and big bowl of popcorn. 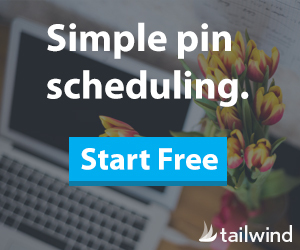 It is also the easiest platform to automate using Tailwind, which is ideal for your busy entrepreneurial lifestyle. With a little bit of effort and strategy, you can wield the exponential power of Pinterest to grow your creative small business. Pinterest absolutely should be an integral part of your visual marketing strategy and I can help you get started. Are you new to Pinterest and want more tips to get started? See my introductory post Getting Started on Pinterest and don’t forget to sign up for my email newsletter below. You’ll receive my FREE Pinterest Start-up Guide for your creative small business where I give easy actionable steps to getting started on Pinterest! If you are ready to dive deep and automate with Tailwind, learn more about my How To Use Tailwind course! « Pinterest Sections: Do they improve your search? I listened to your podcast on the “Interior Design Entrepreneur” thinking it would help me with my Interior Design business. But soon realized that I’m totally missing the boat with my other business “Chandler Oaks Barn” a new wedding barn venue here is St. Augustine, Fl. I’m so excited and eager to put these tips into play, but I’m old school (58) and not sure where to begin! 🙂 I am also very busy running both businesses, so I’m wondering if you are available for hire. I’m so freakin excited to have discovered Pod casts, you, and am soaking up as much info as possible to take my businesses to the next level that I cant stand it! I will take the time to read through your info, but just wanted to see if you were available! Hi Wendy! Weddings are really popular on Pinterest and brides are definitely searching for ideas, inspirations and venues! Right now, I am booked for Pinterest management (we are in the middle of a big move as well), but I might be able to make some other suggestions for you if you send me an email at hello at vanessakynes.com. Glad it was helpful, Kalpana!